Rinchen Wangchuk, Founder-Director of the Snow Leopard Conservancy–India Trust, has received an Award for Outstanding Achievements in Community–Based Snow Leopard Conservation. This award was presented to Rinchen by the Snow Leopard Conservancy U.S., to honor Rinchen’s pioneering role in the development of community-based conservation initiatives that are shifting local herders’ perception of the snow leopard from a predatory pest to be trapped or poisoned for killing their livestock to a valued asset worth more alive than dead. Mark Coreth, master sculptor of animals in motion, donated this “field study,” which he created in 2005, immediately after seeing the snow leopard in Hemis National Park during a visit with Rinchen and Rodney Jackson. 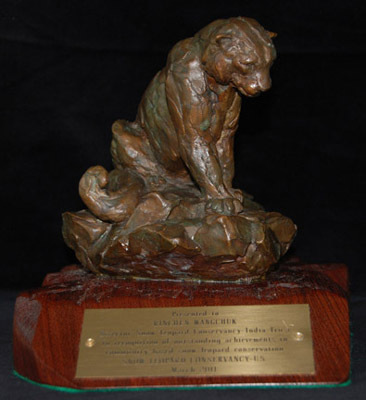 The base for the sculpture was crafted from Indian mahogany by Snow Leopard Conservancy U.S. volunteer Roger Perso. This award also included a grant of $20,000, provided by generous donors. For more than a decade Rinchen has forged enduring partnerships with local communities in the Ladakh, Zanskar, and Nubra regions of northern India. He has brought these communities to the forefront of efforts to protect snow leopards—which may number less than 5,000 across twelve countries of Central and South Asia—and the blue sheep, argali and ibex on which the cats depend. Rinchen has worked with livestock herders to predator-proof their nighttime corrals, and has trained local men and women in income generation skills that are intrinsically linked with snow leopard conservation. He has spearheaded the creation of a conservation education program, blessed by His Holiness the Dalai Lama, for children throughout the region. Perhaps Rinchen’s greatest achievement has been his role in promoting sustainable rural tourism, including the award-winning Himalayan Homestay program. This highly acclaimed UNESCO-sponsored project was launched in 2003, and has catalyzed similar community-driven initiatives in Tajikistan, Pakistan and Mongolia. The Leh–based SLC–India Trust grew out of a partnership with the Snow Leopard Conservancy U.S., led by Rodney Jackson, and now operates as an independent organization devoted to community-based wildlife conservation.